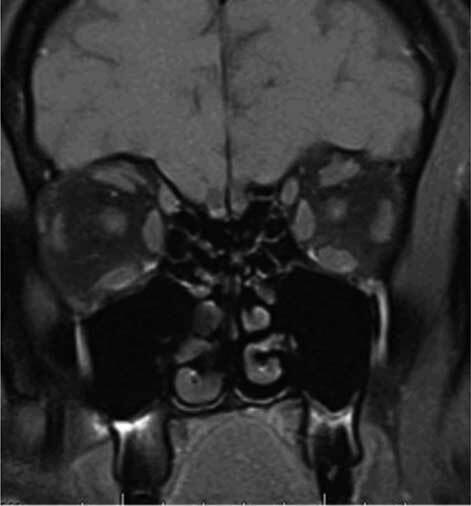 A 77-year-old female presented with a complaint of intermittent, binocular, horizontal diplopia that had been present for the last six months. The diplopia was only present at distance and she denied double vision with near tasks. The double vision was worse with lateral gazes in both directions. She denied any fluctuating eyelid position, weakness, dyspnea, dysphonia, or dysphagia. She also denied headaches, pulse-synchronous tinnitus, transient visual obscurations, and other neurological symptoms. Comments: On Maddox rod, the small left hyper increases on right gaze, decreases on left gaze. Decrease on left head tilt and increase on right head tilt. Figure 1a. The strabismus exam showing a small-angle, incomitant esotropia (ET) that increases on lateral and down gaze. There is an accompanying very small-angle, incomitant left hypertropia (LHT). Motility is full. Note the deep superior sulcus and mild ptosis with high lid creases OU. There is also generalized fat atrophy and midface decent. The strabismus exam showing a small-angle, incomitant esotropia (ET) that increases on lateral and down gaze. There is an accompanying very small-angle, incomitant left hypertropia (LHT). Motility is full. Note the deep superior sulcus and mild ptosis with high lid creases OU. There is also generalized fat atrophy and midface decent. 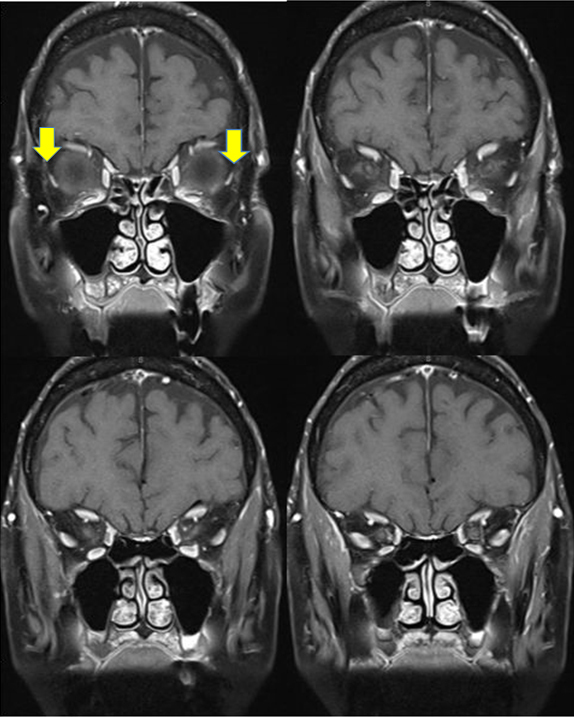 Due to the presence of subacute-onset, acquired, incomitant esotropia in an elderly patient, neuroimaging was obtained. MRI of the orbits demonstrated inferomedial displacement of the lateral rectus muscle bellies in both eyes (Figures 2 & 3). There were no radiographic signs of raised intracranial pressure, thyroid eye disease, mass, or central nervous system lesion. The lateral recti slippage in combination with bilateral blepharoptosis, high upper lid creases, and deep superior sulci suggested sagging eye syndrome as the diagnosis. She was given a trial of Fresnel prism for symptomatic control of the diplopia. She was seen in clinic 4 and 10 months later with stable strabismus measurements and no complaints of diplopia. A prescription for ground-in prism was given and she was scheduled for annual follow-up. Note the position of the lateral rectus muscles in the normal patient on the left versus our patient with sagging eye syndrome the right that has inferomedial displacement of the lateral recti. Sagging eye syndrome (SES), first described by Rutar and Demer in 2009, is a cause of acquired, small-angle horizontal and vertical strabismus that most often occurs in elderly patients . The strabismus is secondary to involutional changes in the extraocular muscles and orbital connective tissues, which result in inferomedial displacement of the lateral rectus (LR) muscle belly. Thus, SES is a mechanical, as opposed to a neurologic, etiology for an acquired strabismus in the older population. 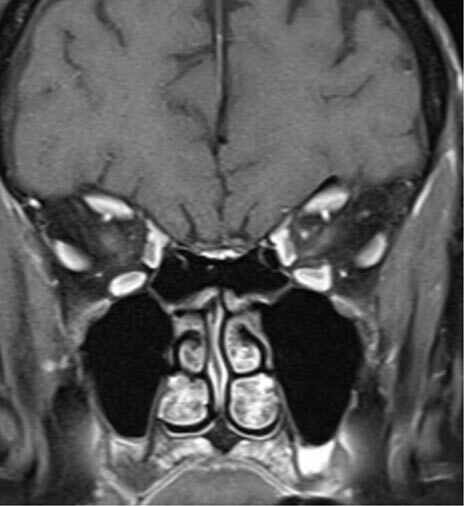 Patients with SES may have involutional blepharoptosis, high upper lid creases, and deep superior sulci. These findings arise due to the age-related degeneration of the levator tendon and its disinsertion from the superior tarsal plate . Often, patients present due to acute-onset or progressively-worsening binocular diplopia. The strabismus may be a small vertical deviation (about 10PD on average) , with excyclotorsion of the hypotropic eye. Another common strabismus seen in SES is a small esotropia, which is greater for distance than near (1.3 PD for near and 11.5 PD for distance on average) . In SES, the ductions are typically full with the exception of supraduction. It is important to note that horizontal saccadic velocities are normal in SES, whereas there will be slowing of abducting saccades with incomitant esotropia due to sixth nerve palsy. A ring of connective tissue that is primarily made up of collagen encircles each rectus muscle belly. These connective tissues are contiguous with Tenon's fascia and located posterior to the equator of the globe. They mechanically inflect the rectus muscle path (thus, they are also known as pulleys) and thereby modulate the vector force that the muscle has on the eye. Similar connective tissue bands, known as intermuscular septa, connect adjacent extraocular muscle pulleys. Thus, connective tissues play an integral role in eye movements in that they affect the action of each extraocular muscle and also couple the extraocular muscles to one another, as well as to the orbital walls . 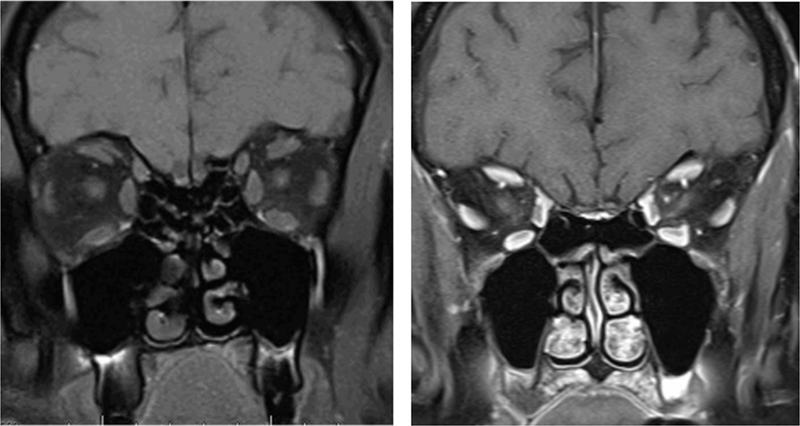 Involution of the intermuscular connective tissue septum between the lateral rectus and superior rectus is the etiology of the diplopia and strabismus in SES. This lateral rectus-superior rectus (LR-SR) band connects the lateral border of the SR pulley and the superior border of the lateral rectus pulley, in order to couple these muscles and also suspend the LR vertically in the orbit . Degeneration of orbital connective tissue occurs with aging and can lead to pathology, such as ptosis from degeneration of the levator aponeurosis [3, 4]. Degeneration that leads to laxity or even rupture of the LR-SR band results in inferior displacement of the LR pulley and muscle, since they are under tension by the intermuscular septum connecting the LR and inferior oblique muscles. Mechanistically, this positional change of the LR alters its vector force, weakening its ability to abduct the eye and also giving it an infraducting action. The positional change of the LR can also result in excyclorotation of the eye as well. This is what leads to the esotropia, hypotropia, and divergence insufficiency pattern of strabismus, with varying degrees (possibly subclinical) of limited supraduction and abduction, seen in SES . Involutional inferior displacement of horizontal rectus pulleys has previously been implicated as the etiology for limited supraduction in older patients . This same mechanism plays a role in the limited supraduction in SES and is proportional to the degree of inferior displacement of the LR muscle . Asymmetric sagging between the eyes causes vertical strabismus, with the more inferiorly displaced pulley inducing a hypotropia and possible excyclotorsion . It is important to note that the hypotropic eye is excyclotorted in SES, which helps to clinically differentiate SES from superior oblique palsy. "Heavy Eye" syndrome (myopic strabismus fixus) is a well described etiology of strabismus in high myopes, in which there is inferior displacement of the LR that results in esotropia and hypotropia with limited supraduction and abduction by a similar alteration in the vector force of the LR . The inferior displacement of the LR is postulated to be related to the enlarged, possibly irregular or staphylomatous, globe shape in high myopes with a possible contribution from mechanical contact between the enlarged globe and the lateral orbital wall . Although they can have similar clinical and radiographic features, SES is also seen in non-myopic patients. MRI of the orbits has been used to elucidate the pathophysiology of SES. Chaudhuri and Demer showed significant displacement of the LR-SR pulley in comparison to age-matched controls. In particular, symmetric sagging of the lateral rectus was associated with a presentation of esotropia, while asymmetrical sagging of the lateral rectus was associated with cyclovertical strabismus. The presenting symptom in many patients with SES is diplopia. Given this, prisms may be beneficial in reducing symptoms. Surgery is generally reserved for severely symptomatic patients who have failed a prism trial. Surgical intervention aims to restore the anatomy of the intermuscular septum and/or correct the vector forces of the extraocular muscles. Sagging eye syndrome represents a mechanical cause of horizontal and vertical strabismus in elderly patients. It is important to be familiar with this disorder as the correct diagnosis may alleviate the need for an extensive work up. 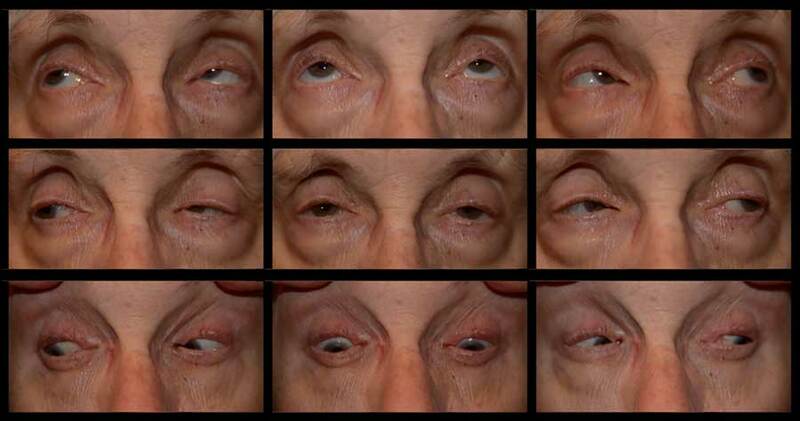 Age-related degeneration of orbital connective tissue results in a mechanical strabismus due to inferior displacement of the lateral rectus - superior rectus intermuscular septum.